South Carolina Electric & Gas Company, principal subsidiary of SCANA Corporation, and South Carolina Public Service Authority (Santee Cooper) announced on July 31 that they are halting construction of two new nuclear reactors at the V.C. Summer nuclear power plant. The reasons cited for this decision include rising costs, decreasing electricity demand, construction delays, and the bankruptcy of Westinghouse, the lead contractor for the project and the designer of the reactor. The project to build two additional reactors at the V.C. 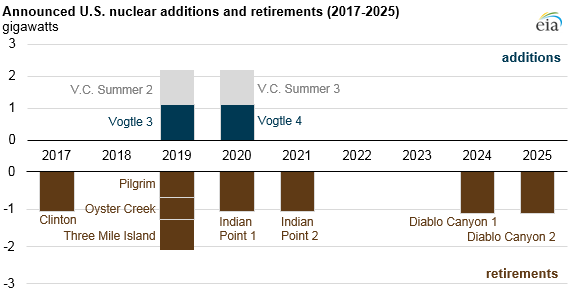 Summer nuclear power plant had begun in 2009, and the reactors were scheduled to come online in 2019 and 2020. If the reactors had come online by 2021, they would have been eligible for a federal production tax credit. However, despite initial plans for the two reactors to come online in 2016 and 2019, the project was at least five years behind schedule. Located near Columbia, South Carolina, V.C. Summer has one currently operating reactor with a capacity of 971 megawatts (MW), which came online in 1984. 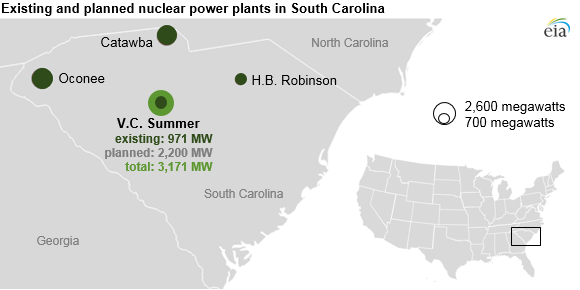 South Carolina is home to four nuclear power plants with a total capacity of 6,576 MW across seven generators. V.C. Summer units 2 and 3 would add another 2,200 MW of electric generating capacity. Nuclear power plants accounted for nearly 30% of South Carolina’s electric capacity as of May 2017 and provided 58% of the state’s total generation in 2016—the highest share of any state in the country. In 2016, only Illinois and Pennsylvania generated more electricity from nuclear power. 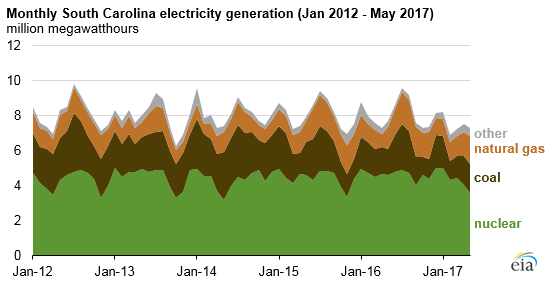 The remainder of electricity generation in South Carolina was provided mainly by coal (21% in 2016) and natural gas (17%). The United States has 99 currently operating reactors, and with the exception of Tennessee’s Watts Bar unit 2, no new reactors have been built since 1996. Watts Bar unit 2 was only partially built before construction was suspended in the 1980s, and it was subsequently completed over 2007–2014 and came online in late 2014. In addition to V.C. Summer, construction has been underway at Vogtle nuclear power plant in Georgia. While Westinghouse is also the primary contractor for Vogtle, and the plant must also deal with production tax credit deadlines, the Georgia Public Service Commission has noted differences between the Vogtle and V.C. Summer projects. The commission plans to release a progress report on Vogtle later this month.